In Japan, the year is counted in two ways. One is with the Gregorian calendar that is used worldwide; this is known as seireki or “western calendar”. The other is by the year of the reign of the current emperor. 2008 on the Gregorian calendar is the 20th year of the Heisei era, or the reign of Emperor Akihito, which commenced in 1989. The period preceeding the Heisei era was known as Showa. The Showa period lasted from 1926 to 1989, the longest reign of any Japanese emperor. Generally though when people think of the Showa period in cultural terms, they’re thinking of postwar Japan, especially the mid ’50s to the early ’80s. “Showa Retro” refers to things that were popular during that time - things that people who are adults now grew up with and feel nostalgic for. Aluminum used to be very popular as a bento box material when I was growing up, but has somehow lost favor. Nowadays plastic dominates. I guess it’s because aluminum, being a lightweight metal, can dent fairly easily. It’s very durable though and easy to keep clean. It also doesn’t absorb the flavors and odors of food like plastic can. Aesthetically it has that nice dull-silver sheen. It can also be printed or silkscreened with bright graphics which contrast nicely with the color of the metal. 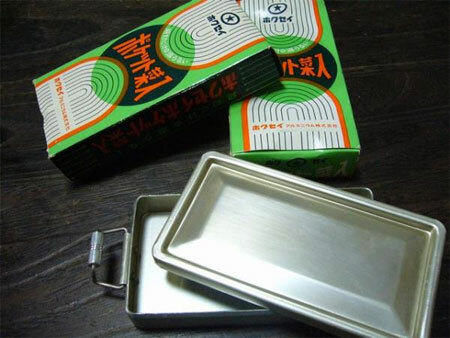 Old aluminum bento boxes from the ’60s and ’70s (sometimes newer) are often sold on Japanese auction sites like Yahoo! Japan Auctions . People don’t necessarily use them for bentos, though some do. 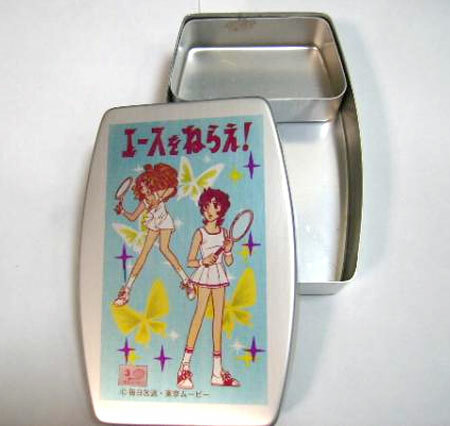 Popular lifestyle and design magazines like Tennen Seikatsu （天然生活）and ku:nel (クウネル）have popularized their use as retro room and desk accessories. They’d make great little sewing boxes since they have dividers or compartments inside. Here are a few from recent auctions. This one is printed with a picture from a tennis manga called Ace o nerae! (Aim for the Ace!) that was tremendously popular in the ’70s. 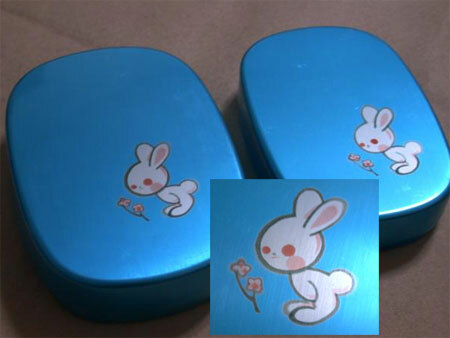 This blue aluminum box has the cutest ’60s-retro bunny imprinted. And of course, the ubiquitous Hello Kitty. 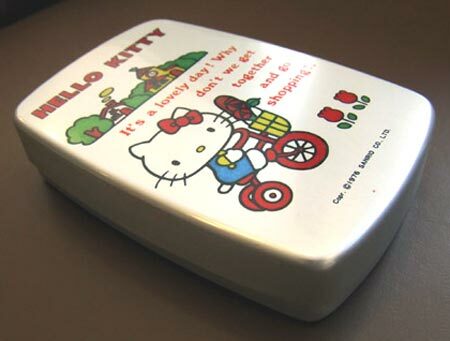 The design on the box has a copyright date of 1976, the year the mighty Kitty was copyrighted by Sanrio. Plain aluminum boxes are desirable too. These are okazu boxes, meant to fit inside a bigger box or supplement it. It has a rubber seal around the lid to hold in leaky foods. I would not use them for food anymore, but they’d be perfect for holding buttons. Aluminum bento boxes are still made. Even newer ones have a nostalgic feel to them - maybe it’s that silvery color. J-List carries a couple  (I’m partial to the Totoro design), and you can also find them on eBay sometimes. Incidentally, the aluminum used for bento boxes is specially treated with a non-reactive coating, so acidic foods should not erode it, especially if you use a new box. I would be a bit wary of leaving something very acidic like umeboshi directly on the surface for an extended period. Some old aluminum bento boxes have a hole in the middle of the lid where the umeboshi has eaten through it!